Last week I finished a much needed no cell phone, no computer vacation on a cruise ship that went to Mexico and the Cayman Islands. I stayed the night after my cruise in Tampa, and with the free time I had, there was really no choice but to check out some local beer. 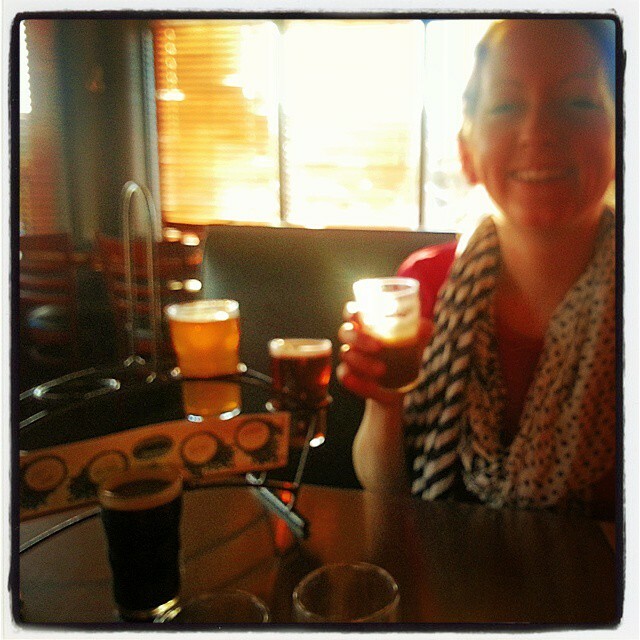 I decided on Cigar City Brew Pub where I had an appetizer, dinner, and sampled six beers. Just a quick note – Cigar City has a Brewery and a Brew Pub in Tampa. They do have many beer selections in common – but some are different. If you’re from Wisconsin like me, you’ll appreciate their beer cheese pretzels (top notch). Everyone everywhere should start putting plantains on cheeseburgers. Everyone. I’m going to start with two basic beers that are a go-to at Cigar City. They’re both must haves if you visit. First, the beer that put Cigar City on the map, the Jai Alai IPA. It’s a perfect IPA for a vacation in Florida and I absolutely understand why everyone loves it. This beauty has a light hop and orange fruit (almost melon-y) smell. Once you taste it, the experience gets even better. It tastes bitter, but quickly leaves you with a fruity aftertaste. Next I want to highlight the Tocobaga Red Ale, which our bartender insisted had quite the following of loyal drinkers. It has a clean spicy hop smell, and that’s exactly the aftertaste the beer leaves you with – making it a really well rounded experience. The taste when the beer hits your tongue gives you a quick kick of sweet caramel malt flavor before heading back to hops. Overall the flavor in this beer is really clean, and with a smooth texture and medium weight it’s easy to drink. There are four other beers that I tried on draft at Cigar City – and I wanted to do my best to summarize them all here quickly for you. The Cody Fowler Brown Ale is great for those of you who want a smokey beer and a hoppy beer all at the same time. This beer wasn’t for me, but that doesn’t mean it’s not well put together. It smells like roasted chocolate, and has a bitter smokey taste. If you like smokey beer you’ll absolutely like this. If you don’t like smokey beer, you should stay open and take a note that Cody Fowler is actually a little less bitter than you’d expect and doesn’t have a typical dry sticky aftertaste of smokey beer, it has a light hoppy one. Next up is the Clara Frye Rye IPA (which people should really call RyePAs – right?). This might be my favorite. Smells like light floral hops, bitterness, and a hint of orange peel. What’s great here is the flavor follows the smell, and it only remains consistent from there. This is a straight forward, ultra bitter, medium weight beer. If you like hoppy beers with a little bit of creative flavor, this is the beer for you. The Minaret ESB (on Nitro) has an interesting malty tart apple smell, and the bitter hop flavor is added in when you start to taste it. The aftertaste is light and since it’s on nitrogen, it goes down very smooth. If you like a lot of flavor, give it a try! Last but not least, the La Rubia Blonde Ale is one of those nice beers for those of you who aren’t typically beer drinkers because it’s a lighter weight than your average blonde, and sneaks that hop flavor in really discretely. La Rubia smells floral and lemony and begins with the same taste. Some super subtle hops pop up late in your tasting. It leaves you with a crisp aftertaste and is easy drinking. Cigar City Brewing has a lot of creative brews, which usually means something for everyone. I didn’t like them all, but they’re certainly decent quality and a good bunch to taste. There were two good defining traits of Cigar City’s beer for me. One was that the aftertastes were all clean, complementary of the beer’s flavor, and not overwhelming. The second is that most of the beers were slightly lighter weight than I thought they would be – which made for easier drinking. For more on Cigar City, you can follow them on twitter @CigarCityBeer, and check out more of Cigar City’s Beers on their website. You’ll find a lot of great looking brews that should be great to try.